If all you expect to get out of your scale is a daily update on your weight, you are drastically underestimating this simple bathroom fixture. Today’s scales can measure everything from your body mass index to your bone mass, and with connected apps and fitness trackers, the bathroom scale could be the central tool to help you reach your fitness goals. Here are a few of our favorites. Even though it’s smart, the Garmin Index Smart Scale doesn’t actually have GPS. But that’s about the only feature missing from this smart device. Garmin has become a leader in fitness wearables, and if you own one of the company’s fitness bands, smart watches, or cycling trackers, the Garmin Index Scale would be a great addition to your healthy lifestyle. The Garmin Index Scale connects to Wi-Fi and seamlessly uploads your data — which includes your weight, body mass index, body fat/water percentage, bone mass, and skeletal muscle mass — to the web. You can also use it to check your vital statistics, including any data gleamed from your other Garmin products, on the Garmin Connect app. While this bathroom scale offers a ton of personal insight into your health, it isn’t meant solely for personal use. The Garmin Index scale can recognize up to 16 users. Read our full review here. The Withings Body Scale is similar to the Garmin Index scale in a lot of ways. They both measure weight, BMI, muscle mass, and fat percentage, and they both benefit from a sleek design. While the Garmin may be the better choice if you’re already operating within the Garmin universe, the Withing Body Scale has a couple of appealing features. In addition to showing your daily weight, the Withing Scale also displays your last eight weigh-ins directly on the display, so you can see if your weight is trending up or down. The display screen can also give you weather updates or display the number of steps you took the previous day — that is, if you’re using a Withings tracker. This smart scale also can last up to 18 months on four AAA batteries. The Withings Health Mate App connects to more than 100 fitness apps, including Beeminder, Google Fit, Fitbit, and LoseIt. If you’re looking for more metrics, Withings does offer a more advanced scale, the Body Cardio Scale, which measures pulse wave velocity. While this is probably a very important aspect of your health — it’s associated with hypertension and risks of cardiovascular incidents, after all — it may not be essential when choosing a bathroom scale. The newer model, Nokia Body+, is available for $100 on Amazon. If you’re a fan of Fitbit, you’ll want to check out the Fitbit Aria Smart Scale. This device has been a mainstay in homes of the heart healthy since it was first introduced in 2012. While the Fitbit Aria Scale shares many of the same features as the Withings Body Scale and the Garmin Index Scale — it measures your weight, BMI, and body fat percentage — what separates the Aria is the Fitbit mobile dashboard. Fitbit is one of the most popular wearable manufacturers on the planet, and for good reason. The Fitbit app can do almost everything, including track your weight, measure your step, and send you encouraging messages to help you meet your goals. The Fitbit Aria Scale is a great bathroom addition for anyone who wants to get serious about their health. Read our hands-on impressions. The Polar Balance isn’t just a scale — it’s also sort of like a fitness coach. The Polar Balance is also the first scale on our list for under $100. Despite it’s small price tag, the Balance can keep up with the likes of Garmin and Fitbit, providing you with accurate readings regarding both your weight and BMI. While the Balance isn’t as advanced as the Fitbit Aria or the Garmin Index, this scale makes up for it with its “holistic” approach to weight management. In addition to tracking your measurements, the Polar Flow app also provides personalized tips to help you reach your weight-loss goals, like suggesting you go for a run or skip some carbs. The Polar Balance can also be paired with numerous activity trackers and mobile apps, so you can keep track of every aspect of your fitness regime. Does the QardioBase measure your weight? Of course. Does it track your body composition in a well-designed app? Absolutely. Is it compatible with a host of fitness trackers and activity bands? Definitely. While the QardioBase shares many appealing features with the scales mentioned above, nobody makes a prettier bathroom scale. Yes, a pretty bathroom scale. The QardioBase is as much of a fitness tool as it is a decoration. In addition to its eloquent design, the QardioBase also has a unique “pregnancy mode” that’s specifically designed to help women keep a visual record of the changes their changing bodies. Read more here. If spending more than $100 on a bathroom scale makes you a little queasy, check out the Nuyo Wireless Scale from Health o meter. 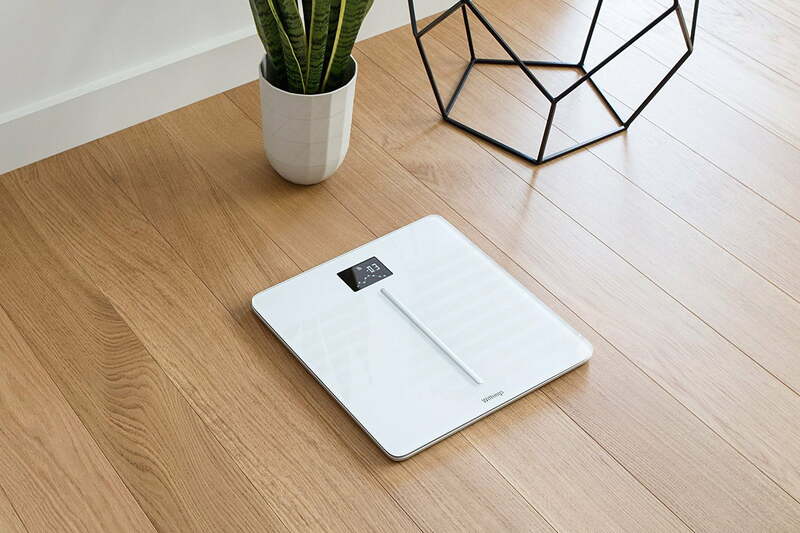 This smart scale accurately measures your weight, calculates your BMI, and wireless transmits your data to the Nuyu app via Bluetooth, all for half of the price of its competitors. The Nuyo Wireless Scale also features a disappearing display. When not in use, the face of the scale appears as blank glass. The display only appears when you step on the scale and quickly vanishes when you step off. Read more here.